My computer has been running without any problems for a while now, but out of nowhere I got two BSODs and there was only few hours between them. This got me concerned and I figured you guys could help me identify the problems, since I'm not that tech savvy myself. I believe it was the same 1A error at both times, but can't be absolutely certain. In both cases I was playing a game, and had firefox + it's flash plugin running at background. I was only able to get the most recent dmp file though, but I hope it helps. At another note, there's been few weeks from the last Windows update. I got a bit paranoid, since there was an update way back which caused some random BSODs. Remove Daemon Tools/Alchohol completely. SPTD.sys is known to cause BSODs. Use Crystal Disk Info to upload a screenshot of your Hard Drives (s). Then test your Hard Drives (s) running a Hard Drive Diag. Pay close attention to Part 3 of the tutorial "If you have errors". Take the test for at least 7-10 passes. It may take up to 22 passes to find problems. Thanks for your quick reply and sorry that I took some time to reply back. I'm quite busy at the moment, so I only had time to scan for viruses (nothing major found) and take the screen from the hard drives and speccy summary tab. I also reduced the number of programs at start up. Haven't had another BSOD yet, but my firefox has been crashing awfully lot in the last two days. I wonder if it could have something to do with this? Anyway, I'll try out memtest and hard drive diag in the as soon as possible and report back. PS. Not sure if this is relevant in any way, but my graphics card runs around 65-75 when heavily stressed. Used to run a bit higher, but I started using MSI Afterburner and created a custom fan speed profile. PS(2). The I: and H: Hard drives in the screenshot are external HDs. 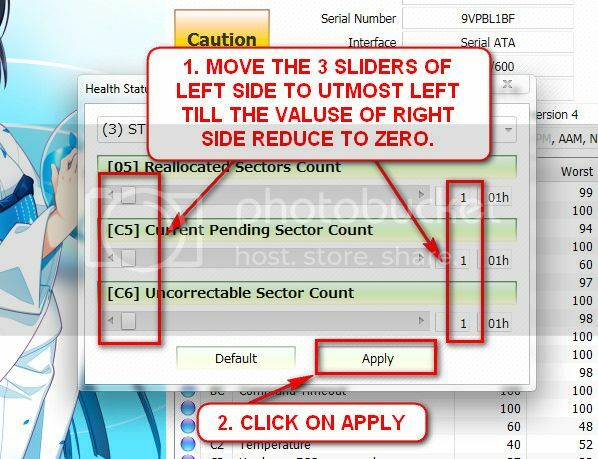 In the resulting window, there are three sliders in the left. Drag them to the ultimate left, and notice the values at the right side are converting to zeros. 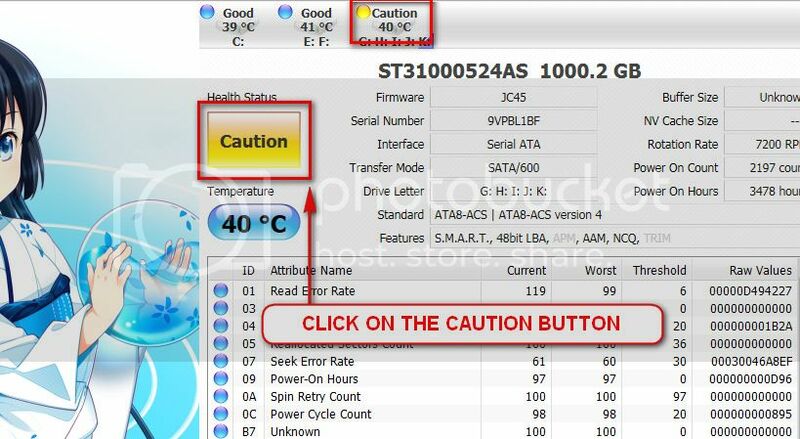 Now click the apply button, and notice that the caution is gone. Sorry for the lack of updates, been quite busy. I did the seatools windows scan, (long and short generic) the samsung HD. It failed on both cases, but passed the seatools S.M.A.R.T scan. I also had another bluescreen. I added the dmp file in a zip as an attachment. I would've uploaded the whole deal using the SF diagnostics tool, but it gave a missing file error (SysApp or something), weird. Huh, yes it is. It was the only one in the dump folder though. I wonder why it didn't create a new dump file. As a side note, I'm going to leave my pc to run memtest86 overnight and see if it finds anything. Well I ran the memtest86 (v.4.0) for just under 5 hours, 9 passes or so, and there were PLENTY of errors. I believe the only test with no errors was the first one, other had random numbers of errors if I read the summary correctly. I can't really say that I know how to read the information given by the memtest correctly, but I'm rather sure there should be absolutely no errors if the memory were good. Should I test the ram seperately to know which one (or both) is the faulty one, or can memtest tell me that? I've also heard that errors could be happening because of wrong memory settings in BIOS (voltage, clocks, etc.). Is there any way to confirm this? Can the older version of memtest cause problems? I happened to have boot cd of 4.0 already and used that. The newest version is 4.3.5 or something like that. Well I spent better part of the night testing out the slots and the memory. Turns out that one of the RAM sticks were faulty. I replaced it and haven't had bluescreen yet. I think the problems is now fixed. Haven't had program crashes, which were freguent, and my PC starts up way faster without the faulty ram. Thanks to both of you for your patience and help.